Blame it on Eating Well Magazine that I just ordered seeds for five more varieties of heirloom tomatoes. That’s on top of the four I already have–and considering that only two of us live here anymore, we’re in danger of serious tomato overload. At this point in the early-yet-but-heading-into planting season I can’t be trusted with seed catalogs or gardening magazines–my itchy planting fingers, my eyes-bigger-than-my garden appetite are easily seduced into buying more seeds than I need. Even Kate rolled her eyes yesterday when she saw my seed box. Mindful of my tendencies, I did my ordering a good month ago and then hid the catalogs. Who knew that an innocent evening curled up with a great cooking magazine would land me in this kind of trouble? 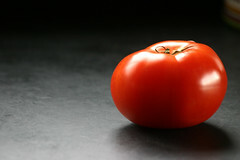 Blame it on the new staff gardens and the “First Harvest” article in the April issue. 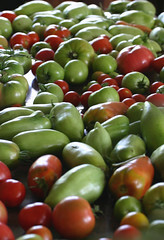 In the SEED SOURCES box, Tomato Fest lists over 600 varieties of organic and heirloom tomatoes. Six hundred?! Just a peek won’t hurt. I love growing tomatoes — few gardening pleasures compete with harvesting (and then eating) fresh tomatoes from my own plants. The plants are lovely deep green entanglements dotted by red as the tomatoes ripen. The plants even smell good, sending out an earthy green scent. They grow well almost anywhere in my garden, though I am careful not to plant them in the same spot in successive years, to give the soil a rest. They grow well (and prettily) in patio pots or in small raised beds. Last summer’s Eating Well article on Amy Goldman and her 500 varieties of heirloom tomatoes sings the considerable gifts of this fruit. But 500 varieties?! Every year I grow San Marzano for sundried tomatoes (for pesto and sprinkling in many, many dishes) and tomato sauces, both raw and cooked; Brandywine for luscious fresh-off-the-vine eating and incredible chutney from fruit that doesn’t ripen; Cherokee Purple for its color and citrusy flavor, plus this year, a few of the Sicilian heart-shaped varietal my daughter’s Sicilian boyfriend brought me from his mother. And of course a single cherry tomato plant. Now that my daughters have left home we can barely keep up with the bounty of one productive plant. By midsummer those little cherry tomato orbs appear in almost everything we eat, plus small bowls overflowing with them dot empty tables, beckoning snackers at every turn. Sliced tomatoes or caprese salad accompany most dinners. 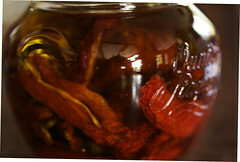 I have a dehydrator to dry them, and I put up jars of tomato-basil jam as well as chutney. Luckily I have bookmarked recipes to help me get the most out of this year’s harvest, such as Roasted Tomato-Bread Soup and Tomato Phyllo Tart–I can use several varieties in both of these preparations–hurrah! Okay, so I probably shouldn’t have ordered those Black Cherry and Camp Joy cherry tomato seeds this morning. But at this point in the late winter, when the sun shines bright and warm, but the snow holds on tight to its blanket, I don’t care. Come summer I will need Italian Heirloom and Italian Tree tomatoes to infuse my Mediterranean-dominated cooking (am I a sucker for anything with Italian in the name? ), and Dagma’s Perfection, a yellow tomato I usually spend far too much on at the farmer’s market when I crave golden gazpacho. And in a couple of weeks, I will get the pleasure of planting those seeds and seeing them pop up and grow tall and full beneath the warm grow-lights. But I’ll be good and plant only a couple of each of the new varieties as test runs this summer; share seeds with friends and family, grow extra plants to give away. 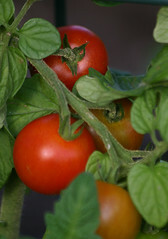 If these varieties take to the soil, the sun, the ecosystem here, and we like their flavor, texture, cooking and storing qualities, I’ll plant them again next year and vow to stay off the Tomato Fest website, and perhaps even out of the April issue of Eating Well if they keep on tempting me like that!